Part of Georgia’s success in selling its signature crops is through visibility and creative marketing. 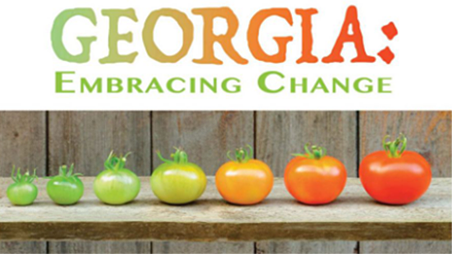 One such example is the Georgia Organics Facebook page, which has nearly 30,000 followers and features executive director Alice Rolls in the organization’s “Food Is the Answer” video. The group sees local food as a connecting force in society, as does the Georgia Restaurant Association, which has partnered with the Georgia Department of Agriculture’s branding initiative, Georgia Grown, to create a statewide Executive Chef program. The Executive Chef program is intended to foster relationships between chefs and farmers with the goal of making it easier for consumers to support local, seasonal produce when dining out. Georgia Grown, which has over 900 licensees, has set a goal that 20 percent of every meal served in Georgia schools will be grown in-state by 2020. In turn, growers are enjoying the benefits as well. “We’re consistently turning up on lists of the best places in America to find a good restaurant,” says Poole.